We are trained and qualified to NPTC standards with £10,000,000 public liability insurance. 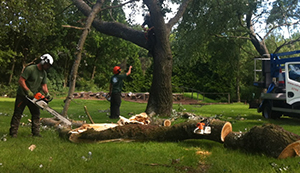 We are experienced at delivering quality tree work at very competitive prices, on time, efficiently and with the utmost professionalism. Tree stumps can often be deemed unattractive as well as attracting fungi and parasites to your garden. 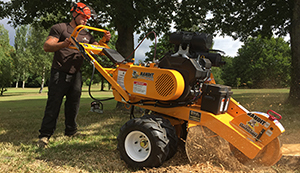 Stump grinding is the most cost effective method for removing unwanted stumps. 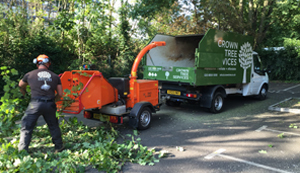 Call 020 8850 5938 or email info@crowntree.co.uk for a free quote. Crown did a fantastic job of dealing with a problem tree which was growing into the back of our church. David came promptly, looked at the problem and had the team out to fix it so quickly. Feedback from our tenants is always positive about Crown Tree. A friendly, professional and tidy team! David and the team were a real pleasure to have working on our premises, they left our garden in a better condition than when they started!